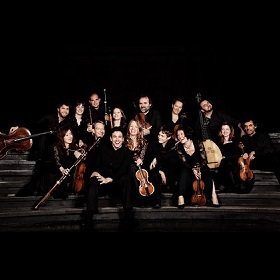 Bach Consort Wien is one of Austria’s most important Baroque ensembles. In addition to numerous performances in the Vienna Musikverein, the ensemble is regularly present on concert stages throughout Europe. Bach Consort Wien, co-founded by Rubén Dubrovsky in 1999 in Vienna, is one of Austria’s most important Baroque ensembles. In addition to numerous performances in the Vienna Musikverein, it is regularly present on concert stages throughout Europe. The ensemble found its specific musical language in the intensive study and analysis of J.S. Bach’s work. The size of the ensemble varies according to the repertoire played and follows the principal »as small as still sense-making«. The resulting clarity, force of expression and personality are the particular characteristics of the Bach Consort Wien. The rediscovery of works by important Baroque composers is another relevant aspect of the ensemble’s activity. In the aim of this spirit, Bach Consort Wien presented the first performance in modern times of the oratorio Christo nell’ Orto by Johann Joseph Fux, during the 2010 Fux anniversary as part of the Osterklang Wien and Psalm Graz festivals. Easter music by the Vienna court composer Francesco Bartolomeo Conti with countertenor Franco Fagioli followed in 2012. The world premiere of Pergolesi’s La Maddalena al sepolcro at Ancona Cathedral in 2011, which UNITEL CLASSICA recorded as part of its cycle of the complete works by Pergolesi on DVD, was another milestone achieved by the ensemble. In 2013 Rubén Dubrovsky’s first edition of the opera seria Polifemo, a masterpiece y Nicola A. Porpora, was presented at the Theater an der Wien with great success. Soloists including Verónica Cangemi, Florian Boesch, Bernarda Fink, Carlos Mena, Emma Kirkby, Terry Wey, Deborah York, Antonio Giovannini, Kirsten Blaise, Yetzabel Arias, Yeree Suh, Gianluca Buratto, Daniel Johannsen, Christophe Coin and Erich Höbarth have concertized with the ensemble. The Bach Consort Wien performed at concert venues including the ORF Radiokulturhaus, Osterklang Vienna, Palais Esterházy in Eisenstadt, Styriarte Graz, Brucknerhaus Linz and Feldkirch, Händelfestspiele/Halle, Festival Rhein Vokal, Schwetzingen (Germany), Winterthur (Switzerland), Ancona (Italy), Palau de la Musica Valencia, Palau de la Musica Barcelona (Spain) and Estoril Festival (Portugal). Since 2014 the annual easter concerts of the Bach Consort Wien are broadcasted by ORF, 3Sat and other TV broadcasters. The ensemble has released live recordings of Monteverdis Selva morale e spirituale (DVD, ORF), Händels Messiah (CD, Gramola/DVD, Naxos), as well as the CDs Pace e Guerra with Countertenor Terry Wey (Sony/Harmonia Mundi) and Vidala - Argentina and Roots of European Baroque (CD, Gramola) – nominated twice for the Preis der Deutschen Schallplattenkritik. In 2018 followed live recordings featuring Vivica Genaux (CD, Sony) and Andreas Scholl (CD, Gramola) with works by Antonio Vivaldi. Music by Vivald with mezzo-soprano Vivica Genaux. Works by Vivaldi, Piccinini, Hermanos Simón, Chazarreta, u.a. Oratorio in three parts by Georg Friedrich Händel, HWV 56 (1741).